The road from sites built with pure HTML to WordPress was not a short one. From an all-text experience, web design has moved on to highly interactive web presence. In addition to that, we no longer have to write markup ourselves but can let content management systems do the heavy lifting. However, that doesn’t mean that static HTML websites don’t exist anymore. In fact, HTML5, the latest iteration of the markup language, is very powerful and allows you to build quality websites without a CMS behind them. Yet, the growing market share of WordPress shows that more and more people are switching to the platform. For some of them, it means moving from static HTML to WordPress. This can be a daunting task, but this post will attempt to explain how to do it in a few simple ways. Below, I will show you several ways how to convert from HTML to WordPress. First, you will learn what the different options are as well as their pros and cons. After that, I will show you how to execute each of them step by step. To move from HTML to WordPress, you need to turn your HTML design into a WordPress theme. A theme controls the look and the feeling of a WordPress website, while the functionality is provided by the CMS itself as well as additional plugins. To make the switch, you have several options. Which one is the right for you depends on factors like the time and money you are able and willing to invest, your coding skills and personal preferences. Following are the main options. The first option is also the most technical. If you go this route, you will take your existing code and use it as a starting point to create the WordPress theme files. It’s not too complicated, especially if you have coding experience. You can pull it off with a bit of HTML, CSS and some PHP knowledge. A lot of it is copy and paste. While your site will do its job, you won’t be able to manage it completely via WordPress. For that reason, I personally prefer the next option. In my opinion, this is probably the easiest and most reasonable road in terms of effort and monetary investment. Instead of using your existing site as the jumping-off point, you use a ready-made WordPress theme instead. You then adjust only its design so that it resembles your old website. Doing so lets you take advantage of WordPress fully while still retaining your old site’s look. You also won’t have to add WordPress features afterward. Instead, you can build on an existing theme – something that the WordPress platform is explicitly made for. Obviously, if you don’t insist on using your current design and are open to changing it, things get even easier. In that case, all you need to do is set up a site, install the theme and import your HTML content. As you will see below, this is a very quick and painless process. If your goal is to start from scratch and create your own WordPress theme that resembles your existing HTML website, start from here. Don’t worry if it sounds intimidating, you’ll see that it is anything but. Just a few files and folders, as well as some copy and paste, is all it takes. The first thing you need to do is create a new theme folder. You can do that on your desktop like you would for a directory on your computer. Name it whatever you want your theme to be called. Don’t do anything with them yet, keep the files open in the editor. You will need them soon. Theme Name — Here goes name of your theme. It can be anything you want but it’s usually the same as the name of your theme folder. Theme URI — You would usually post the theme’s homepage here but you may use your own site address. Author — That’s you. Put your own name here or whatever you want to be called. Author URI — A link to your homepage. It can be the one you are building or whatever makes sense. 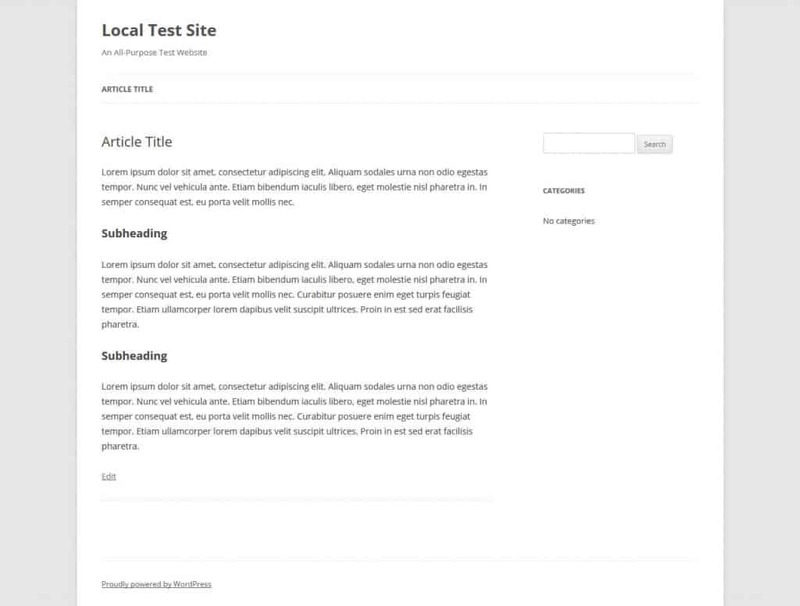 Description — An optional description of your theme. This will show up in the WordPress backend. Version — The version of your theme. Since you are not publishing it, it doesn’t really matter. I usually put 1.0 here. License, License URI, Tags — These things are only important if you are planning to submit your theme to the WordPress theme directory. You can leave them out in this case, I just included them for the sake of completion. 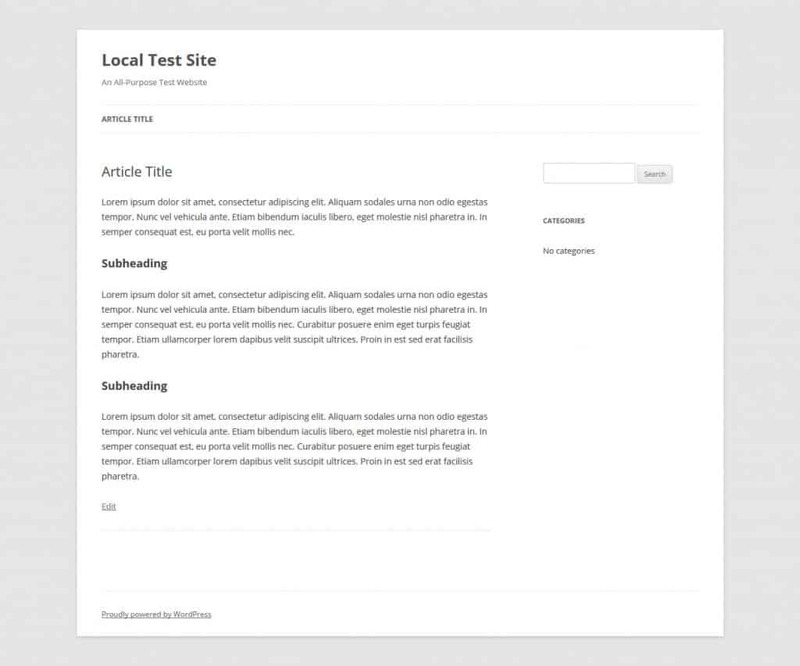 After the header, copy and paste the existing CSS from your static HTML website. Then, save the file in your new theme folder and close it. Time to move to the rest. For the next part, you need to understand that WordPress usually uses PHP to pull information from its database. For that reason, you need to chop up your existing HTML into different pieces so that the CMS can put them together properly. While this sounds complicated, all it means is that you copy and paste parts of your HTML document into several PHP files. To demonstrate this better, I have put together a simple example page that you can see below. If your design is different, you might have to somewhat adjust the steps below. However, the overall process stays the same. 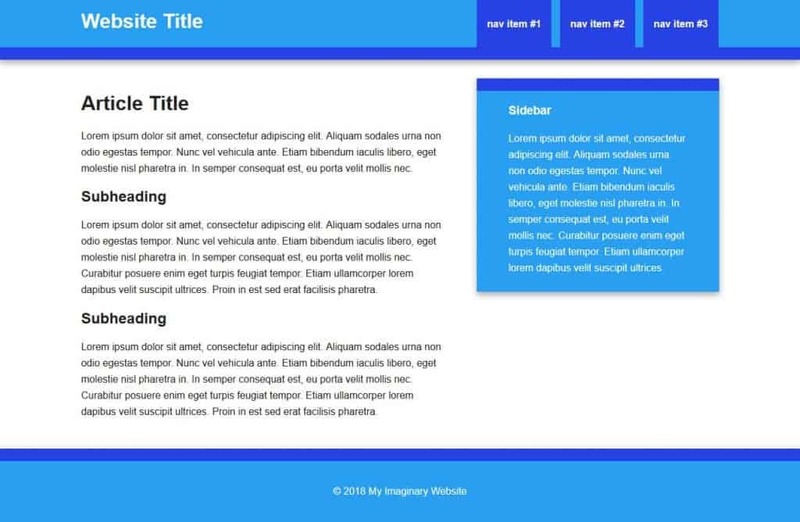 Everything from the beginning of your HTML file to the main content area (usually signified with <main> or <div class="main">) goes into this file. In addition to that, right before where it says,</head> copy and paste <?php wp_head();?>. This is crucial for many WordPress plugins to work properly. Everything belonging to the section<aside> goes into this WordPress file. Now, all that’s left from the end of the sidebar to the end of the file should be the footer information, which goes here. After that, add a call for <?php wp_footer();?> just before the closing bracket</body> for the same reason as you added wp_head in the header. After that, you are done with index.html and can close it. Save all other files to your theme folder and close them except for header.php and index.php. You have some more work to do with them. These are the calls for the other files that contain the rest of your site. You might notice the space between the call for the header and the sidebar. That’s where you will add The Loop. Now, save index.php file and close it. Well done! Your basic theme is ready. Now you can add it to your new WordPress site. Now you will add a theme screenshot that, together with the information from your style sheet header, will serve as a preview of your website in the WordPress backend. To do that, open your existing site in a browser and take a screenshot with your preferred method. After that, open the image editing software of your choice and crop it to 880×660 pixels. Save it as screenshot.png and add it to your theme folder. Now you are ready to upload your theme. To get the new theme onto your WordPress site, you have several options. However, the prerequisite is that all files reside inside your theme folder. The first option is to create a zip file out of it. After that, go to your WordPress site and then to Appearance > Themes. Here, click Add New at the top and then Upload Theme. In the upcoming menu use the button to browse to the location of your zip file. Mark it and click Open, then Install Now. When it’s done, activate the theme. Alternatively, you can connect to your server via FTP (or just go to the local directory on your hard drive) and navigate to wp-content/themes. Then, upload your (unzipped) theme folder there. After that, activate the theme from the same place as before. Nice! Your new site’s front end should now look like your old site. All that’s left to complete the move from HTML to WordPress is to import your existing content. We will cover this further below when talking about using an existing WordPress theme. Be aware, however, that while the basic theme works now, there are more things you can do to integrate your HTML better with WordPress. This includes making your blog title and description editable, adding widget areas, comments and much more. You might also have to add CSS markup because the content is not part of your original design like images. As it is a lot of work, I personally like to use a solution that already has all that functionality and only needs a design change. That’s what I will show you next. If the above seems too intense for you, the next method might be more manageable. It allows you to take advantage of thousands of existing WordPress themes while still retaining your original design. That’s by using a so-called child theme. These themes are built on top of another theme (the parent) that don’t stand on their own but merely modify the parent theme to fit your needs. Easy enough to do though it takes a bit of detective work. The first step is to pick a suitable theme to base your design on. For that, it helps to find a theme that is close to your existing design (so you won’t have to change too much) or use a theme framework or a starter theme, which both are made to work as a base for custom themes. Check the WordPress theme directory, our list of awesome themes or look into premium themes to find a suitable candidate. After some searching, I decided that the Twenty Twelve theme would make a good starting point for my move from HTML to WordPress. Usually, I would pick something more up to date, but it goes well with the simple design I am working with. Once you have taken your pick, install the theme on your WordPress website like you would install any theme. No need to activate it. As mentioned, it’s just there to provide a base for you to work with. The rest happens in the child theme. Similarly to the earlier method, for the child theme, you need to create a theme folder. Here’s where you will put all the files belonging to it. When creating child themes, it’s common to call the folder the same name as the parent theme plus -child. So, since my child theme is based on the Twenty Twelve theme, I call its directory twentytwelve-child. Whatever name you choose, just be sure not to include any spaces as it won’t work that way. The child theme also needs a style sheet. This one will work almost the same as the style sheet created above. However, it has a slightly different header and will contain less code. As you can see, it’s very similar to the style sheet header you used before with one exception: it contains the Template tag. In that section, you should put the name of the theme that will function as the parent. Without it, the child theme won’t work. To avoid this, input the folder name of the parent. So, for Twenty Twelve, that would be Template: twentytwelve. With just the style sheet and the folder, it’s already possible to activate the child theme. However, that wouldn’t do much good since right now your site would look like an HTML page without any styling. To change that, you first need to inherit the parent’s styles and for that you need functions.php. 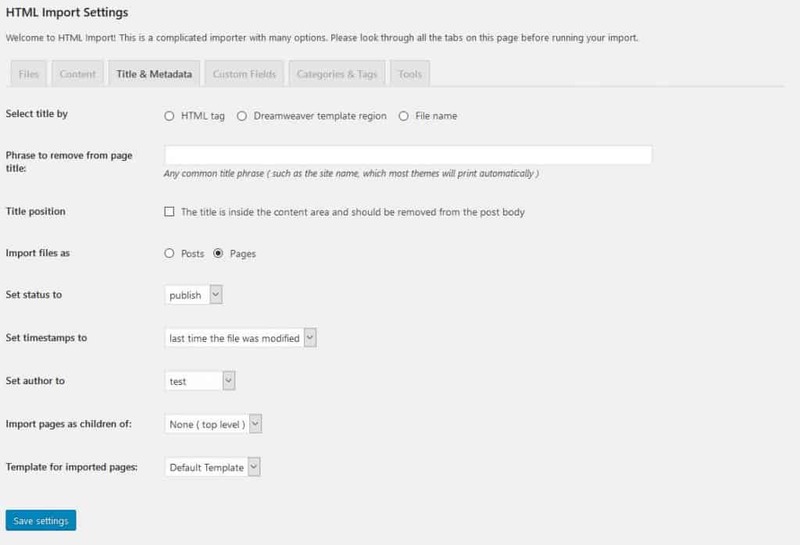 This file is an important part of any WordPress installation and allows you to make sweeping changes to your website. This piece of code tells WordPress to go to the template directory (aka parent theme) and use the styles included there. It also makes it possible to modify the theme via your child theme (more on that later). At this point, the child theme is ready to be activated. You can add a screenshot to it as in the instructions above if you want. Aside from that, you can either zip it up and add it to WordPress via Appearance > Themes > Add New > Upload Theme or by simply adding the folder as is to wp-content/themes. In both cases, when you activate the theme, your site should now look exactly like its parent. Here’s where the aforementioned detective work begins. It’s now time change the design of the existing theme so that it resembles your original HTML site. For example, one of the first things that stands out is that my WordPress theme adds space above the header and below the footer that my HTML site doesn’t have. That’s because anything you add to the child theme’s style sheet overrides the styles in its parent. However, the rest of the markup stays intact, so you are only able to change the things that are relevant. Plus, if you are using an HTML5 template as a starter and a modern WordPress theme as your parent, a lot of the basic markup will correspond, making your life much easier. There’s a lot more you can do with child themes, which you can learn here. Once you are done adjusting the design, it’s time to import your content. Let’s get to that now. Finally, on the list of moving from HTML to WordPress is using an existing theme as is and simply migrating your content from your HTML site into it. This is the simplest way – all you need to do is install and activate the theme of your choice (I assume you know how to do that by now) and then follow the steps below. By the way, though this process isn’t super hard, there are things that can go wrong. For that reason, make sure you back up your WordPress site before going through with it. The first thing you need to do is install the plugin HTML Import 2. The easiest way to achieve this is to go to Plugins > Add New and search for it by name. When you find it on the list (it might be further to the bottom), click on Install Now. Activate it when it’s done. 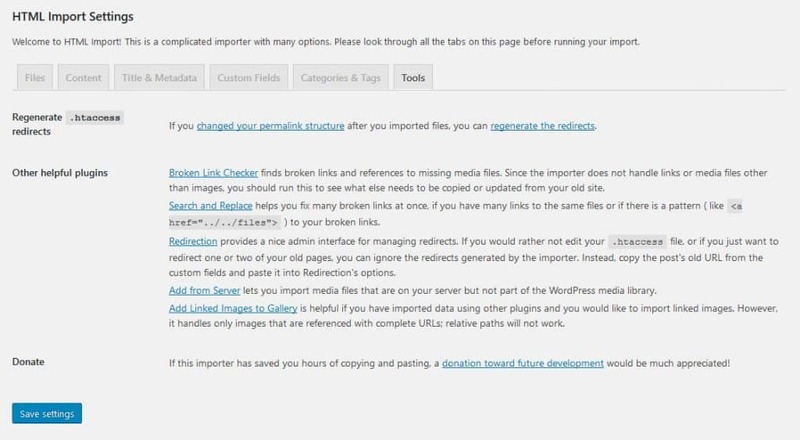 To import several pages at once, you need to upload them to the same server as your WordPress installation. The plugin will propose something like html-files-to-import as the folder name but you can choose whatever you want. Just make sure to remember the path name. As you will see in the following, you can also import single pages one by one. For either method, go to WordPress and Settings > HTML Import. We will go over the most basic settings now. If you need additional information or if anything is unclear, refer to the official user guide. Directory to Import — Enter the path that you just copied your existing files to. Old site URL — Used for redirects. Enter your old URL. We will deal with this again later in this article. Default file —The default file for directories on the old site, usually index.html. File extensions to include — The extensions of files you want to import. Directories to exclude — If you have any directories in the old site that you don’t want to import, enter them here. Preserve file names — To have the plugin automatically using your file names as the new URL, check this box. This makes sense if your titles are very long because usually, the importer will use them to create the slug. 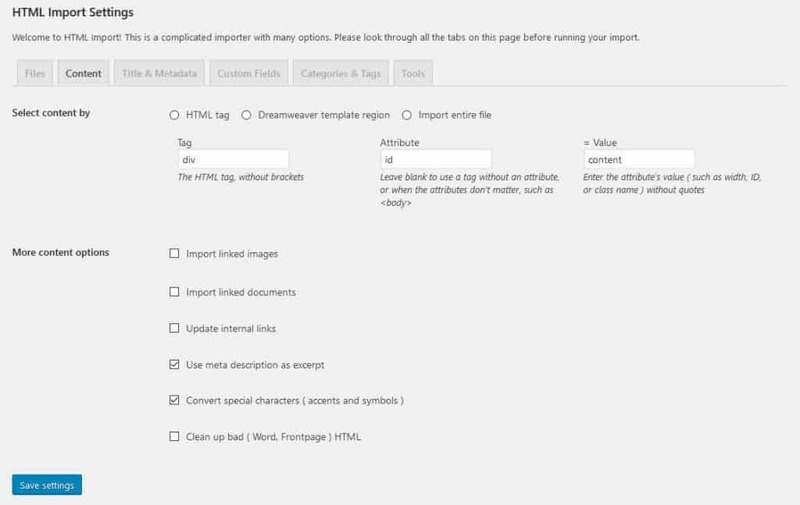 Under content, you need to configure the HTML tag that contains your site content. To do that, choose the option HTML tag at the top. Then configure the tag in the following three fields. For example, if your content is contained in a tag called <div id="main">, the information you input would be div, id and main. The other settings on this page should be self-explanatory and enable you to import images, documents, update internal links and more. This part is similar to the content part before. However, it’s dealing with page titles. In the beginning, you need to tell the plugin how titles are marked in your HTML template so it can import them into the right place. In addition, you are able to filter out redundant things like the site title as that’s often displayed by WordPress themes by default. If your titles reside inside the content, you can also tell the importer to delete them so they are not included twice. What’s important is that you decide whether to import your old content as posts or pages. The rest is rather self-explanatory and lets you configure WordPress settings for new pages. 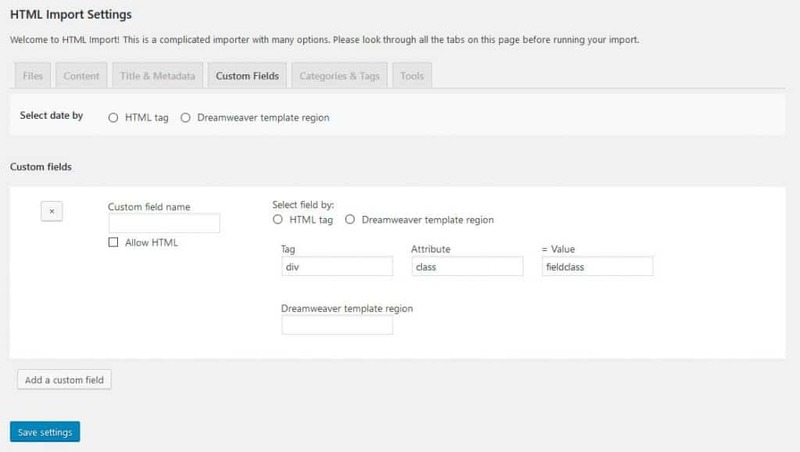 If you have any data that needs importing into custom fields, you can configure this here. 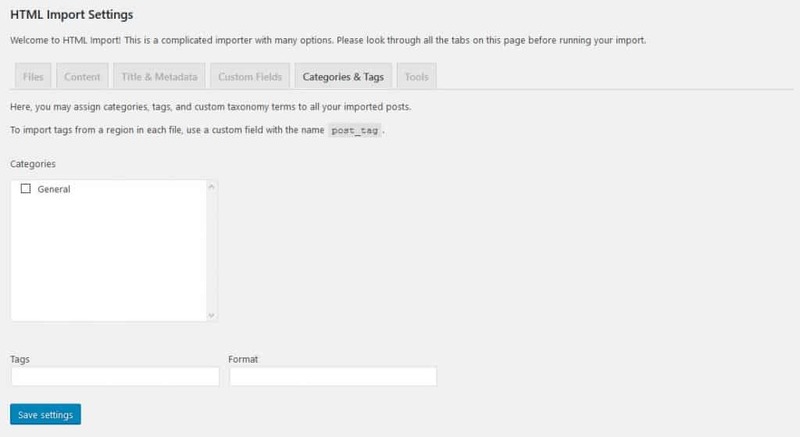 Here you can assign categories, tags and post formats to your imported content. 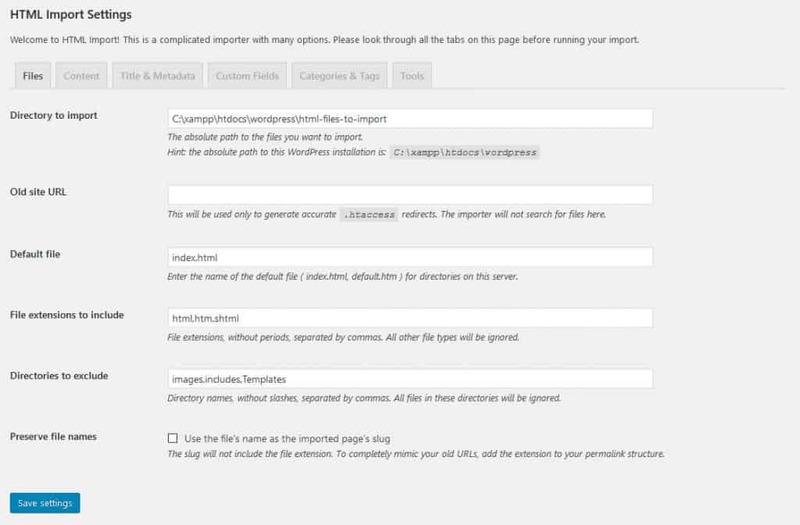 The plugin will show existing taxonomy on your site to make this step easier. This screen lists a number of useful tools for successfully importing from HTML to WordPress. Once you are done, save the settings. This will enable the Import Files button. Click it to get started. Next, choose whether to import a directory of files or a single file (you need to browse to it), then hit Submit. The plugin will then go to work. Once done, you should have all existing content on your WordPress site and formatted by the new theme. Or, if you went one of the other routes, your site should look basically the same as your former HTML website. Nicely done! If you plan on deploying the WordPress site in the same place where the static HTML website used to be, there a few more things to do before you finish. The first one is to check the URLs of your newly imported posts and pages to make sure they are search engine friendly (i.e. include the keywords you want to rank for). It’s very simple – just go to a page or post and look at the URL below the title. To change it, click Edit on the right, change to the URL to your choice and hit Ok.
A second thing is to implement redirects from the old URLs to the new. That way, you won’t lose out on existing SEO value. If you have filled in the old site address in the HTML plugin, it will create the redirect code for you. You can copy and paste this into the file.htaccess that resides on your server (usually in the root directory). You access it via FTP, however, you might have to enable seeing hidden files as it isn’t visible by default. Then edit .htaccess and input the rules. Be aware that it only works if you have left the URLs unchanged. If you haven’t and need to set custom redirects, use the Redirection plugin. It’s a very comfortable solution that also tracks whenever somebody lands on non-existent URL on your site. That way you can implement redirects for those links as well. Did You Successfully Move from HTML to WordPress? And that’s it. You just learned how to convert a static HTML site to WordPress. As a consequence, you have become part of one of the largest communities on the web and gained access to thousands of resources to make your site even better. Aside from that, I wish you good luck with your newly minted WordPress website. I hope you enjoy working with WordPress as much as I do. Did you move your site from HTML to WordPress? How was your experience? Any tips to add? Please let us know in the comments section below. Nice guide – I didn’t know about the HTML import tool. I noticed that the HTML import tool doesn’t handle sidebar imports though.. I guess I’d have to do those manually. hi, thanks for this, I tried it and it worked, but have some issues, my header has some images to display and they aren’t displaying well….well is there any php function like the “” that will echo the index of my site so I can navigate to my images? Hey, I’m not sure what it is you are trying to do. There are WordPress functions to echo images that you can define in the Customizer for example. I recommend you look at the header of an existing theme that has these capabilities to implement it in your theme. Great article! Lotta work went into it. Thanx. I’m an old guy’, so at this point in my life I operate on the KISS principle. The amount of work involved in the methods you share below is outside of my time constraints. Most of my html’s I wrote from scratch way back when, so there’s no money in converting them, so I won’t pay to get it done. Thing is, I can’t imagine that, after all these DECADES of public “coding”, the programmers haven’t designed a SIMPLE METHOD of converting the various types of html into WP. Open the conversion program, select your original html file, click a radio button on what version and type it is, and then click another radio button on what WP you want to convert it to. Result: CONVERTED HTML INTO WP, no errors. Pretty sad such an animal doesn’t exist. I just wish programmers weren’t so damned lazy. They remind me of electricians and electrical engineers! Hi Chris, thanks for the detailed comment! There are actually some tools out there that claim to be able to do the conversion automatically. However, I haven’t tested any of them and thus can’t say anything about the validity of their claims. The things described in the post above are the best ways that I have found to make the switch. Especially if you are not hung up on your current design, the import plugin is a really good option to move your content over. From there, you can go for any design that you want. I hope you find a good option for yourself! Nice article. This really helped in guiding me through a successful migration. Happy to hear it! Thanks for taking the time to write a comment. You help me so much! Dude! Glad I could help! Thank you for sharing this. I am running into a issue following the child theme process and using the plugin that you mentioned. I see that the HTML came through but no images are displayed. Actually, I have web designed in adobe muse. I am looking to upload the entire html, css, images to wordpress because i want to create an ecommerce website. Adobe muse is kind of limited with ecommerce but is very good with designing. So I am trying to upload it in wordpress to use ecommerce plugins. Do you have any suggestions for me? Hey Pratima, thanks for taking the time to write a comment! Unfortunately, I don’t have any experience with Adobe Muse, so I can’t give you any specific advice. Have you checked whether the images in the page are pointing to the right locations? Aside from that, images not showing up in WordPress is often an issue of using the wrong file permissions, so you might want to look into that. Let me know if it works! I’m doing my first conversion from a static html site to a Dynamic WordPress site. The article helped me quite a bit, thanks. I was just wondering – after I install WordPress, add the html importer plugin and import the files, will the URL’s be the same as those of the static html site? I just want to make sure so that I don’t hinder any SEO efforts. thanks for the comment. As mentioned in the article, you can tell the plugin to preserve the file names as URLs or create new URLs and have it set up redirects. In any case, if one of the URLs is not to your liking, you can easily change them within the WordPress editor or even via Quickedit inside your lists of posts and pages. Hey Dru, thanks for leaving a comment! If the URLs stay the same then there should be no need to do any redirects. The case might be slightly different if your original URLs have different endings (such as .html) but if they are completely the same there should be no problem. Cheers! You make it seem do-able…can’t wait to try it on one of my 20 year-old sites! Thanks!!! Happy to help! Thanks for taking the time to comment. Cheers! Great tutorial, I was looking for something like this in a while to help me convert my static website to a mobile friendly version offered by WordPress CMS. Thanks again ! Glad to be of service, Octavian! Thanks for taking the time to leave a comment. I am glad the tutorial was helpful to you. Cheers! Thanks for the great post. My situation is a bit different. I’ve run a static PHP site for 10 years, decided to convert to WordPress. I set up a staging subdirectory and spent several days rebuilding and improving 28 PHP content files as Pages. My permalinks are 2- and 3-word hyphenated links, such as “air-compressor-mount”, etc. The original site gets upwards of 1400 user hits per month, mostly from Google organic searches. Several outside websites, including posts from an outside forum, link to two particular pages. I’d like to preserve SEO, but I’m not sure how to go about Redirection without plopping 28 Redirect 301 lines in my htaccess. Thank you for your post. May I contact with you for further problems? Hey Rush, sure. You can get in contact with me through my website. I’d be happy to help if I can. Hey there, that’s exactly what the article above is about. Just follow the steps and you should be able to figure it out. Good luck!